Are you looking for a unique favor for a Christian religious occasion? These magnificent Cross statues will captivate your guests. 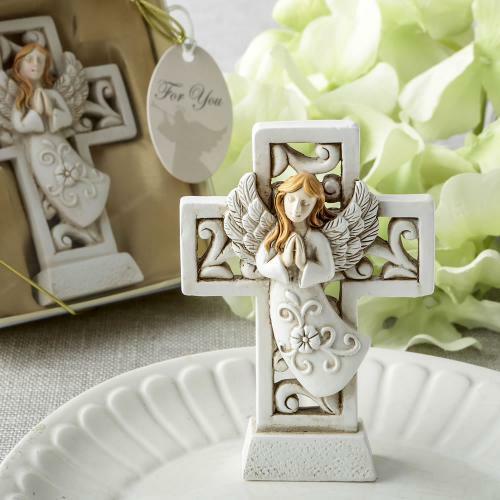 Adorn your event tables with these stunning Cross statues made from polyresin. The Cross is intricately hand crafted with an ornate scallop open-work design and hand painted in an ivory color. Framed against the Cross is a beautiful matching ivory colored, raised praying Angel with outstretched wings and golden hair. This exquisite statue will enchant your guests. They will be delighted to take one home as a celebration of Christian Faith, Hope and Protection. Size 3 1/2" x 2 3/8 x 1/2"